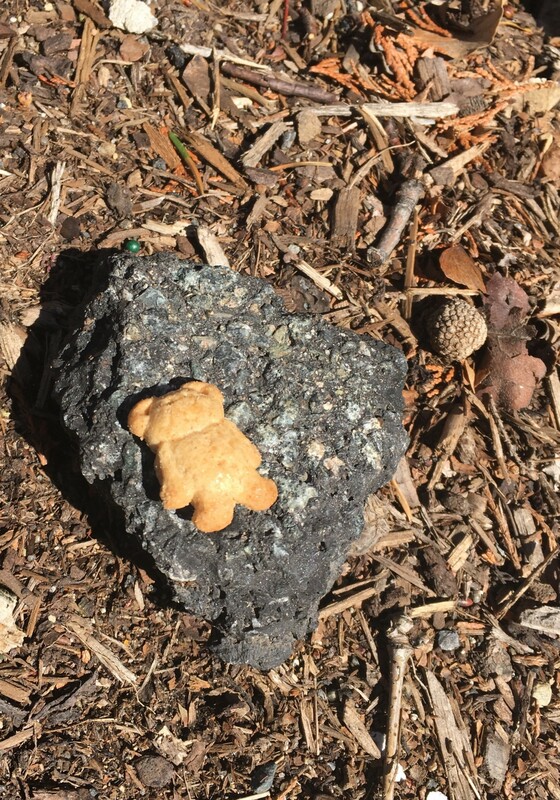 Today I walked by a Teddy Graham cracker lying on a rock. It was lying flat out on its back, and upon closer inspection, I saw that the rock was a piece of driveway asphalt about the size of a fist. I stopped to take a picture on my phone. The sun was bright and the sky was blue. College students walking toward the busy intersection up ahead stared at me as they passed by, and looked sideways at the ground to see what I was photographing. But I felt happy to see the cracker on the rock. It made me smile even brighter than the purple and yellow crocuses did, the white star flowers and the green leaves that had pushed their way cheerfully out of the wintery soil. I was that teddy graham. I felt flat out on my pregnant back, metaphorically speaking, heaving and hemming to walk a few blocks to the ATM. Losing my temper so easily at minor frustrations. Annoyed at the “plugged in” world around me where everyone seemed to be wearing headphones, rushing, grasping, and getting what they wanted. And yet, the teddy bear was at peace. The teddy bear had surrendered. It was a cracker. Perhaps dropped by a happy baby riding in a stroller, who had simply uncurled his sticky fist and, smiling, dropped the cracker where it now lay on its back looking up at the blue sky. I took a deep breath. The sun was shining and I remembered the things I was thankful for. I love you, graham cracker on a rock.